Pets and Pests: There's a mouse loose in the Read home! And D.W. wants it gone…NOW! When traps fail, Arthur enlists the help of an expert mouse catcher…a fearless hunter who laughs in the face of danger: Nemo?? 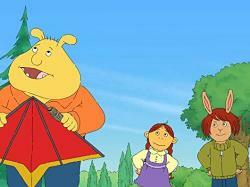 Go Fly a Kite: While playing in the park, Binky, Muffy, and Ladonna stumble upon an abandoned kite. After failing to find the owner, the trio decides to take joint custody of the toy. But sharing it is easier said than done. In the end, they find the owner - it's Carl, who has Asperger's Syndrome - a form of autism that makes him see the world differently than most people. Arthur: Pets and Pests/Go Fly a Kite airs Thursday, August 30, 2018 at 6:30 a.m. on WXXI-TV.